• Unum necessarium - by Cornelis van Dalen. "Een ding is noodig", the one necessary thing, considerations from Johannes Comenius. • Winter Months - the winter months and how to survive them. • Editorial - Feeling responsible for what is happening to the earth and society? • Bees, bees by Cornelis van Dalen. "Honey helps us to grow old gracefully and to ripen the wise fruits of living"; honey as medicinal substance. • The Mysterious Death of Bees by Cornelis van Dalen. Some of the current theories on the death of bees. • The Cleansing Power of Sea and Salt by Cornelis van Dalen. Why is the sea salty? And salt as the "foremost among human remedies." • Thyroid and Iodine by Cornelis van Dalen. Thyroid gland in health and iodine its treatment; iodine preservation tips. • Going, going, going Bald by Cornelis van Dalen. Secrets of hair; Hair loss and its prevention and treatment. • Some Like It Hot by Cornelis van Dalen. Sauna and health - a piece of history and usefulness of steam therapy. • Editorial – the six rules for longevity according to Harry Patch. • "Choose Your Weapons" - by Cornelis van Dalen. Food, digestion and crime - knife violence and nutrition? • Electricity and the Senses - by Cornelis van Dalen. Examining the negative effects of radiant electricity andthe senses. • The Effects of EMR and Technology on the Cognitive Ability of Children – by Cornelis van Dalen. Questioning the benefits of technology and electro magnetic radiation on human development especially children. • Smell of Life and Death – by Cornelis van Dalen. The smell of good and bad is a sense, a judgement. Morality and ethics and the sense of smell. • The New Physis Project. Invitation to contribute to the future of medicine. Special Article: Unum necessarium - by Cornelis van Dalen. "Een ding is noodig", the one necessary thing, considerations from Johannes Comenius. • Saturated or Unsaturated: the good oil in fats – by Cornelis van Dalen. Seeking to explain the ‘poles of the life battery are good oils and good proteins.’ The work of Dr Johanna Budwig. • Tuberculosis and Romanticism – by Cornelis van Dalen. This article was written with the threat of badger cull to supposedly prevent the spread of tuberculosis in dairy cattle. • Desire to Travel – by Cornelis van Dalen. Disease as Life Path – George Orwell, TB and homoeopathic view. • Herb Robert – by Cornelis van Dalen. Geranium Robertianum is a supreme, therapeutic herb, no doubt growing in your back garden. • Thirteen, The Number – what does it mean? • Editorial – Nature and Her ways – she does it all herself; copy Nature and her wisdom. • Earth Energies, Dowsing and Human Frailty – by Cornelis van Dalen. Considering the effects of earth energies, weather systems, and modern technology on the human energy field in chronic disease (especially cancer) and behaviour. Why one needs to move the bed if you are sick. • Stinging Nettles - by Cornelis van Dalen. Looking at the health benefits of nettles – medicine from the wild. • The Manufacture of Madness - by Cornelis van Dalen. What one needs to do if suffering from mental disturbances (depression to schizophrenia) before being drugged by doctors and psychiatrists. • Remedies for the Well-being of the Soul – A doleful tale of the sea, by Seneca. • The Moon and Her Tides in the Rhythm of Life – by Cornelis van Dalen. The effect of lunar cycles on childbirth and disease processes. • Vitality and the Immune System – by Cornelis van Dalen. A look at the real source of immunity. • Editorial – ancient laws versus dogma of science. • Regimen of Health – by Cornelis van Dalen. A brief outline of the task faced in the attainment of health and happiness. • Hospitals – a place for Guests: Part 2 – by Cornelis van Dalen. Further development of the idea of hospitals is a place for healing and not for dying. • Medical Astrology – by Cornelis van Dalen. The stars and planetary influences in nature and in health and sickness. • A Decumbiture Chart – by Agostino Dominici. An example of medical astrology in practice and the charts made up for the patient at the time of sickness and also in this case the time of transition. • Know your Onions – by Cornelis van Dalen. As food and medicine: the myths and medicinal virtue of the onion. • Editorial – a Time for Every Purpose. • The Dawn Chorus and Life Forces – by Cornelis van Dalen. The dawn chorus awakens the earth. The effect of birdsong on plant life, and music on humans. • Milk of Human Kindness – by Cornelis van Dalen. Milk formation in humans, and infant nourishment. • Secrets of the Human Body and other confessions – by Cornelis van Dalen. An introduction to the seminar ‘Health and the Intestines’ – or why death lurks in the intestines. • The Spirit of Calcium – by Cornelis van Dalen. Part Two: Calcium, disorders and remedies. Thought processes and biological transmutation. • Travails of Mankind – by Cornelis van Dalen. Material science and the dangerous incursion into everyday life. Some thoughts on the requirements of the times. • Man is Earth in another Form – by Cornelis van Dalen. The origin of light from another point of view. • Embryology and the ‘gate of man’ – by Cornelis van Dalen. A look at the higher influences of generation and birth – the spiral of creation. • The Spirit of Calcium – by Cornelis van Dalen. Part One: Calcium and its role in human evolution. The consciousness of minerals; calcium as the basis of life – in morphology and thinking. • Malaria and the mosquito – by Cornelis van Dalen. The mosquito is innocent. • Comparing Natural Immunity with Vaccination, a book by Trevor Gunn – reviewed by Cornelis van Dalen. “Once you start, where would it end?” asks Trevor Gunn. • Easter – by Cornelis van Dalen. Moveable feast and planetary mystery. • Petroselium – by Cornelis van Dalen. The myth and healing properties of parsley and its association with Easter. • Blood – the Symbol – by Cornelis van Dalen. Blood, its sacredness in history, blood therapies past and present. Why blood should be protected. • Cholesterol and other virtues – by Cornelis van Dalen. How this ‘evil’ substance, as modern medicine treats it, is transformed into other essential substances is discussed. How to treat the fact of elevated readings. • The Winter’s Tale – by Cornelis van Dalen. The meaning of winter and the Christmas festival. • The Metamorphosis of Light – by Cornelis van Dalen. The relationship between plant and animal/human life – oxygen and carbon dioxide. • The Story Of Weather – by Cornelis van Dalen. Whether or not there is such a thing as climate change or just mere mantra – seeking to introduce concepts beyond material scientific investigation. • The Cedar Getters – by Cornelis van Dalen. A glimpse at the beginning of the forest destruction. • Selenium: a cancer treatment! • Autumn Mists – by Cornelis van Dalen. The beauty of autumn brings meteor showers, health and sickness, and the season of decay and death. • The Mystery of Anaemia – by Cornelis van Dalen. Part One. Blood formation and the role of iron – the anomalies of anaemic states gives rise to many questions and the rightful treatment. • On Plagues and pestilences – by Cornelis van Dalen. These have been with mankind beyond recorded history. Current talk of a pandemic is put in perspective. • The Anatomy of Influenza – by Cornelis van Dalen. Looking at the 1918-19 influenza and the modern view of the avian influenza. • Victor Schauberger and the Living Energies of Water – by Julian Scott. The extraordinary discoveries about the nature of water. • Babies, Breast Feeding and Nutrition Guidelines for growing children – case notes by Cornelis van Dalen. Medical science has ‘mechanized’ birthing processes and made monsters and drug junkies of infants. This article puts forward the ideal of motherhood as once practiced. • The Nano State – by Cornelis van Dalen. The nano and the virus. Nanotechnology is transforming the way science influences (‘influenzas’) society. • Digitalis purpurea – foxglove. The meaning of this flowering beauty in nature and in medicine. • The Metamorphosis of Light – by Cornelis van Dalen. How light is food and food is light – the metabolism of light - eating your greens has purpose. • Heart Therapy – by Cornelis van Dalen. In light of the preceding article, some healing therapy. • Chronic Disease – Chronic Miasms ‘The Wages of Sin’ – by Cornelis van Dalen. Samuel Hahnemann’s brilliant observations predates microscopes and genetics discovery and still outshines modern concepts and treatment of diseases. • The Food Goddess ‘S’ – the ‘don’t cheat or it will take longer to get better’ healing diet plan. • Vaccination – a holy cow – by Cornelis van Dalen. A short history of vaccination and ‘by vaccinating a person we are diseasing him’. • Tsunami – a nightmare – by Cornelis van Dalen. Tragedy viewed from within human kind. • Suppression of Symptoms – by Cornelis van Dalen. The disappearance of the symptom does not necessarily mean the disease is cured. The consequences of suppression: ‘the first mistake is to take drugs and not the remedy’. • Hospital(e) – a place for guests by Cornelis van Dalen. What were hospitals, what are they now, what ought they to be. • The Food Goddess ‘S’ – the gorgeous, beautiful, down to earth, never seen on TV, the matter of fact, Goddess of the kitchen and table offers the ten rules of food, eating and enlightenment. • Extending our understanding of what is normal – by Cornelis van Dalen. Case examples of patient’s experiences which are ‘Beyond the Threshold’. The paranormal is a delusion or an experience of the psychic or spiritual? • The Special Destiny of Samuel Hahnemann– by Cornelis van Dalen. An introduction to the spirit of Hahnemann and his medical discovery. • The Germs are Winning– by Cornelis van Dalen. A short history of antibiotics and the dilemma this drug therapy creates. • In the Likeness of Trees– by Cornelis van Dalen. Plants are sleeping beings. Pruning injures trees. • Insomnia – by Cornelis van Dalen. Why we sleep and when the sandman doesn’t come. • Fresh Air by Benjamin Franklin (1706 – 1790) discoursing on air baths and colds. • Germs & other Pestilences – by Cornelis van Dalen. Do germs cause disease as modern medicine believes? • The Lost Vision of Paracelsus – by Julian Scott. Introduces the Renaissance doctor, alchemist, astrologer and mystic – genius waiting to be discovered. • Soya – go home – by Cornelis van Dalen. Written in answer to a patient who consumed too much soya. • New Physis – an expression for awakening of man and the redemption of Nature. See Prologue on main menu – www.newphysis.com. • Living Water – by Cornelis van Dalen. The mother of life and the lifeblood of earth. • Health – it’s all about definitions – the subtle aspects of true health. 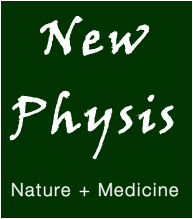 All information published in New Physis is in the interests of developing understanding of Nature and Medicine. Some material may be speculative and/or not in agreement with current (orthodox) medical practice. Information is provided for debate and education, and is not intended for readers to substitute for, or the basis of, medical treatment. Seek advice of an appropriately qualified and licensed physician or other health care provider.